At the Oracle Partner PaaS Summer Camps VII 2017 in Lisbon last year, at the end of august, I attended the API Platform Cloud Service & Integration Cloud Service bootcamp. In a series of article’s I will give a high level overview of what you can do with Oracle API Platform Cloud Service. At the Summer Camp a pre-built Oracle VM VirtualBox APIPCS appliance (APIPCS_17_3_3.ova) was provided to us, to be used in VirtualBox. Everything needed to run a complete demo of API Platform Cloud Service is contained within Docker containers that are staged in that appliance. The version of Oracle API Platform CS, used within the appliance, is Release 17.3.3 — August 2017. See https://docs.oracle.com/en/cloud/paas/api-platform-cloud/whats-new/index.html to learn about the new and changed features of Oracle API Platform CS in the latest release. In this article in the series about Oracle API Platform CS, the focus will be on the Management Portal and creating an API (including some policies) . Be aware that the screenshot’s in this article and the examples provided, are based on a demo environment of Oracle API Platform CS and were created by using the Oracle VM VirtualBox APIPCS appliance mentioned above. This article only covers part of the functionality of Oracle API Platform CS. For more detail I refer you to the documentation: https://cloud.oracle.com/en_US/api-platform. 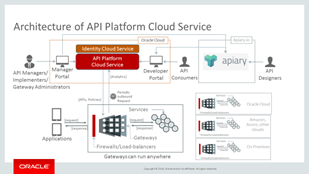 Oracle API Platform Cloud Service enables companies to thrive in the digital economy by comprehensively managing the full API lifecycle from design and standardization to documenting, publishing, testing and managing APIs. These tools provide API developers, managers, and users an end-to-end platform for designing, prototyping. Through the platform, users gain the agility needed to support changing business demands and opportunities, while having clear visibility into who is using APIs for better control, security and monetization of digital assets. Read the complete article here.